This is already the second tank for Minecraft PE which is controllable and perfectly modeled. If you compare the previous tank to this one, you can easily see many new details, thanks to which the tank is a copy of Tiger I. Similar tanks participated in the Second World War and had high technical characteristics. Today's version consists of only one tank, probably in the future will be added new colors. To turn into a real battle tank, you will in any case need a tank gun that shoots explosive shells. The creator took this into account and added a powerful weapon, take it while driving the tank. The Tank addon will perfectly demonstrate the possibilities in multiplayer where there are different mini games. The game together with friends with such tanks can turn into protracted tank fights. 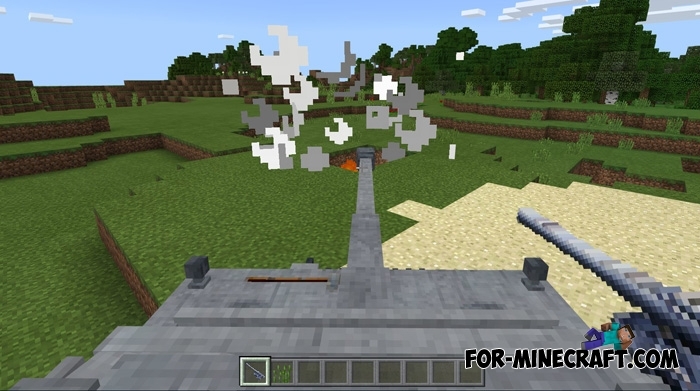 Tanks mod v2 for Minecraft PE 1.0.0/1.0.4.1Would you like to get a real tank?